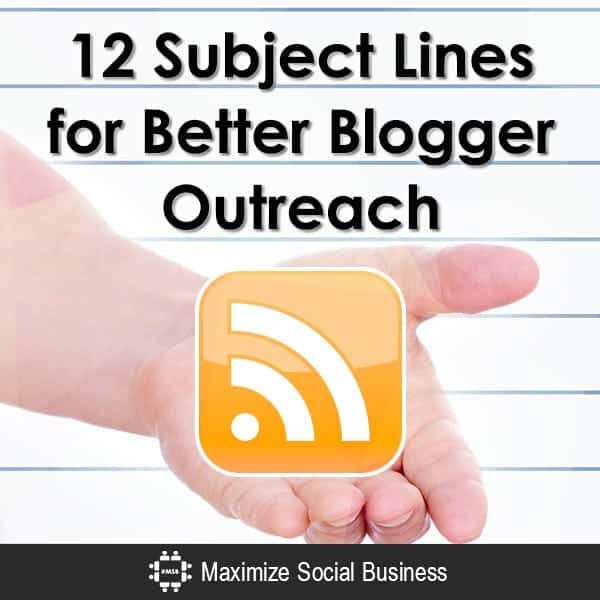 12 Subject Lines to Improve Your Blogger Outreach Campaign. One of the biggest pain points in blogger outreach is getting the attention of the bloggers you know are the perfect fit for your brand. If you follow this blog or the content I write on blogger outreach you should be all caught up on the best practices in pitching bloggers. But, one of the things I’ve seen a lot lately is that marketers are writing really good and personalized pitches and offering legitimately cool stuff to bloggers but their emails aren’t getting read. Honestly, you don’t have to get crazy; the key is using subject lines that are not spammy, personal and to the point. Usually for my subject lines I find a tidbit from the bloggers’s “about me” page or I reference one of their recent posts. So let’s dive into this topic more than we ever have. These 12 subject lines are to inspire and get your wheels turning. Feel free to make them your own and cater them to your brand and your next project. Let us know if you use one by tweeting at @kristenwords and @MSocialBusiness because we are super social and love chatting about this stuff! Referencing something the blogger is passionate about and then suggesting collaboration on the issue is a great way to form a strong partnership. How have we not partnered up yet? I like this one because it’s short simple and to the point. It is friendly and tells the blogger you’re just looking for a way to partner. I see your kids are the perfect age for this event! If you’re working with a parenting blogger, offering something to share with the whole family is the ideal way to form a partnership. Referencing the blogger’s most recent post topic simply shows them that you actually read their blog. Blogger outreach done well considers the brand, the blogger, and the blogger’s audience. Bloggers love to extend giveaways and special offers to their audience, so this subject line is a great one. Doesn’t get more to the point that this. A lot of times brands are reaching out for product reviews so make it apparent right away that you just want to send them something awesome and free. Have you tried bunny skin care products? A lot of times a subject line that asks a question outperforms a statement, so I try to ask questions in my subject lines whenever possible. Another example of a subject line that references a blogger’s recent post. And opens the floor for discussion showing the blogger you are interested in an authentic marketing relationship. This is simply an example of a subject line that references a fact you read about them in the “about me” section of their blog. This subject line pretty much sums up the pitch in a few words. It references content the blogger writes about and makes it apparent that you are reaching out to offer them something new. Have you had success with blogger outreach? What subject lines have you used for your outreach emails? What have you been successful with? Please share with us! This is so damn helpful! When I have to outreach, I really try to keep it personal as if I am talking to the editor. I usually go with something like ‘ I am currently working on something which I would love share with you’. Great post, Kristin! The headlines you listed above are great examples on how to make your blogger outreach much more compelling and not feel forced. Oftentimes, bloggers use pre-made headlines and email messages to reach out to other bloggers. As a result, they don’t get the response they want because of the impersonal nature of their emails. By taking a more conscious effort in writing headlines that pack a punch, bloggers will encourage more bloggers to click on their emails and read their messages. Also, I linked to this post on my post I made about blogger outreach as well christopherjanb dot com/blog/blogger-outreach-basics-how-to-grow-your-readership I hope you don’t mind as this is such a good post. Thanks!